Dusseldorf hosted the opening stage yesterday, and will once again host the start of Stage 2 of the race, with the riders circling around the German city before heading south towards the eventual stage finish in Liege, some 204 kilometres later. It will be a frantic opening to the race, with the first King of the Mountains points up for grabs only 6.5 kilometres into the stage. I expect the Pro-Continental teams, including Cofidis and Wanty Groupe to attempt to take out this opening Mountain sprint, in the effort to have one of their riders on the podium at the end of the day. The Cote de Grafenberg is only a category four climb, and averages just under 5 percent for 1.4 kilometres. It is then a fairly uncomplicated run for the majority of the stage, with the only obstacles being the intermediate sprint after 83 kilometres Monchengladbach and the final categorised climb of the day, the Cote d’Olne, which is completed just outside 20 kilometres to go.. The category four climb is 1.3 kilometres at 4.7 percent. The final five kilometres of the stage look fairly straight for the peloton to deal with, so the sprinters teams should have no major problems in time their appearance at the front for the main sprinters. However, with it being the first sprint of the Tour, it will be a messy sprint for sure. Marcel Kittel will be the man to beat, but can Peter Sagan, Mark Cavendish and Andre Griepel upstage the Quick Step Floors rider and take the win? 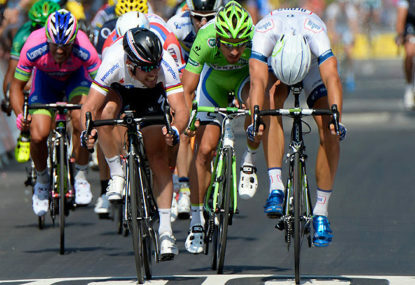 Join The Roar’s live coverage of Stage 2 of the Tour de France from 10pm AEST.